According to ChemOrbis, the European PET market continues to witness gradual increases and local prices are seen drawing near the €1000/ton threshold. The firming trend was attributed to higher upstream costs in addition to improved demand on the back of the approaching high season for PET applications. After an initial March PX contract settled up €90/ton from last month, another PX contract was settled with an increase of €70/ton from last month. Meanwhile, an initial March MEG contract was settled up €75/ton, but players in Europe commented that further settlements have not been reported. 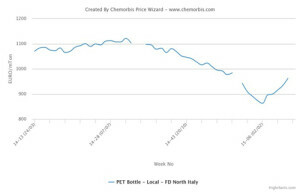 In Italy, a packaging producer reported buying South European PET with additional increases of €20/ton from early March levels. “PET prices at €900/ton have disappeared after the market gained further ground. Demand is good so far which might be due to pre-buying activities ahead of possible increases. We expect the upward trend to extend into April,” the buyer commented. A converter bought small volumes of West European PET €50-60/ton above last month, commenting that demand is improving in the bottle sector given the approaching high season. According to the buyer, PET prices could post further increases in April, but in smaller amounts compared to this month. In Germany, a distributor is giving March PET offers with increases of €30/ton from last month, but did not exclude the possibility of issuing further hikes of up to €50/ton later in the month. A packaging producer bought Central European PET €50/ton above last month. The buyer said that supply is limited as several producers have already closed their order books. Another distributor in France also reported monthly increases of €30-50/ton in the PET market as per ChemOrbis pricing service. According to the seller, the current firming trend is likely to extend into April given firmer upstream costs.